Celia Frost’s life is ruled by fear – fear of a rare disorder that means she could bleed to death from the slightest cut. But when a knife attack on Celia has unexpected consequences, her mum reacts strangely. Suddenly they’re on the run, and Celia has no idea why. All she wants is the truth…but the truth is more horrifying than she could ever imagine, and it’s closing in fast. What is the truth about Celia Frost? This novel is really compelling – you keep reading and reading and reading; even if you have better things to do, you keep reading the story because you just have to know what happens to the characters. 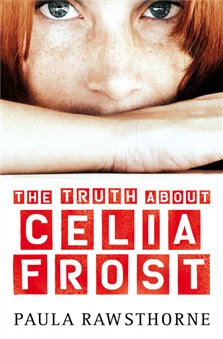 ‘The Truth About Celia Frost’ is amazing, the plot is so unique and every emotion is contained in this story. Happiness, love, fright, heartbreak, anger, freedom; it’s all in there. ‘The Truth About Celia Frost’ is about a girl with a very frightening secret. Her Mum has brought her up to believe that Celia has a terrible illness where she can’t get cut or have open wounds…if she loses ANY blood, she will die instantly. Celia thinks this is all true – it must be! Her Mum wouldn’t have told her she had the illness if it wasn’t true….would she? I cannot tell you how brilliant this novel is. Celia Frost is so brave and so loyal. The story concludes with lots of action, and the writer has written it so well that you feel like you’re in the story yourself. I recommend this to everyone – it is FABULOUS. 5/5. Wow, this sounds amazing! I want to read it now!